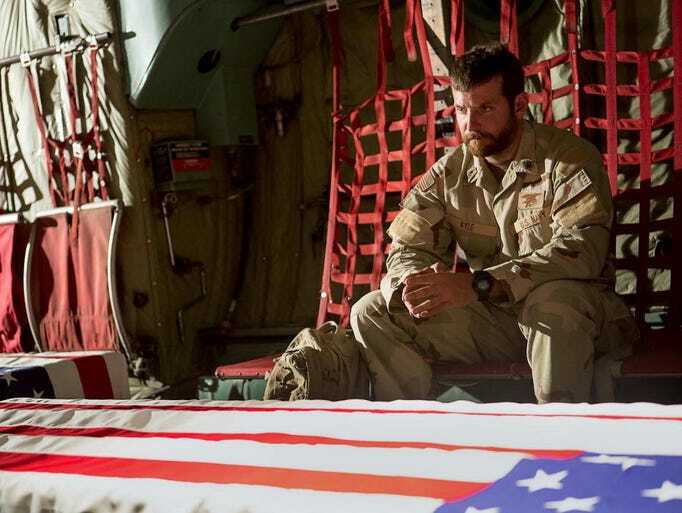 The Short: American Sniper, I am sure will be called lots of things within the political spectrum, as far as the film itself goes, it is an intense, incredibly emotional look at a military legend. It is unsympathetic and predictable but the predictable moments are overshadowed by the transformations by both Bradley Cooper and the unrecognizable Sienna Miller. Chris Kyle led a life that is definitely deserved to be told on the big screen, a deadly sniper that in 4 tours of duty had 160 confirmed kills. Kyle is brought to life by a bulked up Bradley Cooper, in one of the Oscar nominee’s better roles. Cooper as the man nicknamed "The Legend" by his unit, brings depth and emotion to a character that is supposed to be a hero but also a cold, calculated savior. Instead the emotion can be seen on the actors face and through his eyes. Cooper is the best part of American Sniper, not saying the rest of the movie is no good but Cooper earns his Oscar Nomination and then some. American Sniper is an intense war movie a lot like its predecessors, Zero Dark Thirty and The Hurt Locker, yet unlike either film Sniper lacks the shocks that Hurt Locker added early on or the overall intensity that drove Zero Dark Thirty towards the end. In fact some of Snipers more intense moments are telegraphed none more so when Hall's script all of a sudden has a side character with a lot more to say right before getting blindsided. American Sniper works best in the moments where it's Kyle on a rooftop with Kyle Gallner early on or in the more human moments between Cooper and Sienna Miller towards the end of the film. The most intense moments occur in the film’s opening scene or towards the end with Kyle facing off with his main foe an enemy sniper named Mustafa. The other performance that deserves to be noted in American Sniper is that of Sienna Miller who is totally unrecognizable as the brown haired Taya Kyle. Even if the actress isn't given as much to work with, she gives an emotional performance as the supportive yet scared wife. Miller when given real moments gives an outstanding performance but sadly Jason Hall's script isn't strong enough and the story is more about Kyle's war time actions and his PTSD. American Sniper attempts to be just as much about Kyle when he comes home even if it’s in 5 to 10 minute increments throughout the film. It's definitely an important aspect of the story even if it takes away from the films intensity. Cooper gives a handful of memorable moments when Kyle gets stateside even if the actors best scene occurs all alone on a rooftop as he tries to decide whether or not to shoot a child holding a rocket launcher. American Sniper is directed by Clint Eastwood, a man who (sadly) is more known in the past few years for talking to an empty chair at the most recent Republican National Convention then he is for his prowess as a filmmaker. Eastwood concocts a film that is definitely taking a political stance but stays away from being the propaganda some believe it is. Unlike the aforementioned war films that came before this film it doesn't go straight down the middle. Politics aside (there is nothing I'd rather talk about less in a movie review then politics) American Sniper is more a film about a man who had to make tough choices and put himself in harm’s way for something he believed in. Chris Kyle is absolutely an American hero but the movie makes sure you also know about his flaws. According to those who have read the book which this film is based Kyle was overconfident, and unsympathetic towards the lives he took or to any life in the countries in fought in. Eastwood's film plays closer to Kyle believing in the mission, believing in the war but less unsympathetic toward an entire people. American Sniper is a definite Oscar film, Cooper's performance is brilliant and the story is an emotional one. If I had to rank it against similar war films in the last few years I don't think it was better than The Hurt Locker or Zero Dark Thirty. It is Eastwood's best film since Gran Torino, and a memorable addition to the war movie genre. Starring Bradley Cooper, Sienna Miller, Kyle Gallner, Keir O'Donnell, Jake McDorman, Luke Grimes, Eric Close and Sam Jaeger.